As a Persian/Oriental Rug Color Restoration specialist, as well as collector of fine rugs, myself, I’d like to educate you just a bit on caring for your Persian/Oriental rugs. Most handmade Persian/Oriental rugs are made from high quality natural fibers such as wool and silk. It takes many people years to very intricately hand craft one of these rugs. Some are made with natural dyes from bugs and berries, and others from synthetic dyes. One sure fire way to distinguish the difference between the two is, natural dyes in Persian/Oriental rugs will not have an even and consistent color. Synthetic dyes, however will maintain an even color throughout the entire rug. I’ll start with one of the easiest ways to take care of your handmade rug. Rotation Rotation Rotation. Yep. Once a year, you’ll want to rotate that beautiful oriental rug 180 degrees. If you need help with this process, simply call The Carpet Chemist. When rugs are placed in rooms with natural light coming in through the windows or skylight, the sun will take a toll on the color of your rugs. Rugs will lose at least 1% to 3% of their color every single year from sunlight, but the human eye will not even detect color loss until around 10% color loss. Do NOT use over the counter cleaning products on your Persian/Oriental rugs unless they have the WoolSafe logo on the bottle. Water. And not the hot kind. Cold or room temperature is fine, but you’ll want to test for color bleeding with a clean white rag, in an inconspicuous area first. WoolSafe products. WoolSafe products are made specifically for use on your wool rugs. If you look near the directions on the label, you should see a picture of a sheep and the words WoolSafe Products. Call The Carpet Chemist. We have a 3,000 square foot facility that is dedicated to hand washing delicate rugs like yours. We use the required and proper inspection, cleaning and drying techniques that will bring your dull faded rug back to life. Sunlight. If you can avoid placing your Persian/Oriental rug in direct sunlight, I highly recommend doing so. If you must place in in a room with lots of natural light, vacuum regularly and rotate 180 degrees annually. High pH chemicals. High pH chemicals like Resolve or other over the counter carpet cleaning products can fade your oriental rugs color faster than sunlight. Use water and/or a nuetral pH WoolSafe cleaner. High pH chemicals. Pet urine from cats or dogs are extremely acidic and can leave yellow or orange staining, and even remove color from your expensive rugs. If your pets are urinating on your oriental rugs, call The Carpet Chemist right away. Bleach. Bleach spills on Persian/Oriental rugs can not only remove color from the fibers, but may potentially damage the structural integrity of the wool or silk fibers. In this case, you should call The Carpet Chemist right for a FREE assessment of your Persian/Oriental Rug Color Restoration. Custom colors to Dye for! The Carpet Chemist is one of the only Certified Color Restoration companies in the world that is capable of dyeing your faded or color damaged rugs. 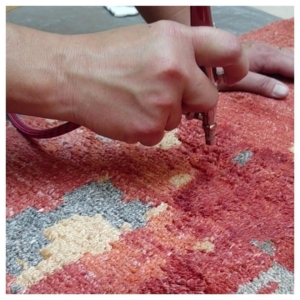 Our process involves custom mixing the world’s best dyes to a custom color formula that will match the original color of your rug, for a full custom color rug restoration. We utilize a few specialty tools including a syringe, which allows us to dye each fiber one by one, and an airbrush system that keeps the temperature at a consistent level, as well as keeping the spray at a smooth even level for pure rug dyeing perfection. Patterns in Persian/Oriental rugs are extremely detailed, and may take several weeks or even months to complete a color restoration. Size, fabric material, and color loss are just a few variables that will determine the time and cost it takes to complete a Persian/Oriental Rug Restoration. Learn to love your old rugs again with The Carpet Chemist’ custom Persian/Oriental Rug Color Restoration service. Bring your old faded rug back to life!